A new title just joined Playstation Hits the JRPG Persona 5 meaning it gets a permanent price drop to $19.99. Sony launched their budget line of Playstation games last year, adding such title exclusive games as Uncharted 4, Bloodborne and The Last of Us Remastered. Now adding the role playing RPG where you lead a double life in Persona 5. It also gains a reduced price of $19.99 via the Playstation store. This is a great time to catch up on Persona as Atlus recently revealed the trailer for upcoming Persona 5 The Royal. 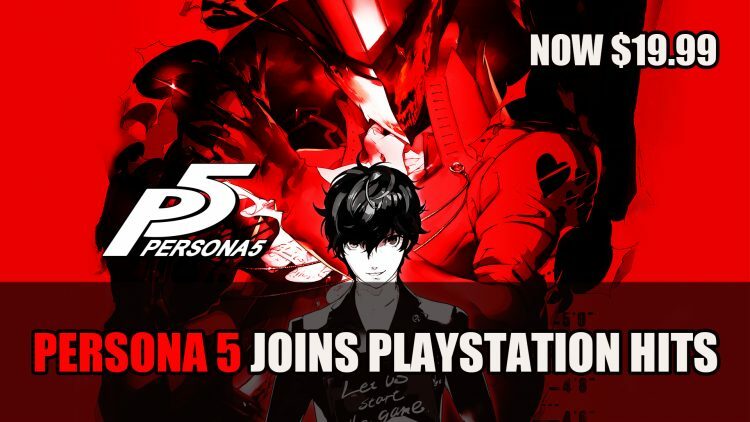 Persona 5 is available on Playstation 4 now as a part of Playstation Hits. For more Persona news be sure to read next Atlus Reveal Persona 5 The Royal Trailer and Atlus Hint At Persona 5R Plus Other New Projects. You can also read this raving review if you want to find out more of why its a great title in Persona 5 Review: Stole My Heart. Still no PC version in sight, despite Atlus’s attempt to shut down the PS3 emulator RPC3 for supporting Persona 5 emulation with the lame excuse that they did so because they wanted PC Persona 5 players to get the best experience possible.